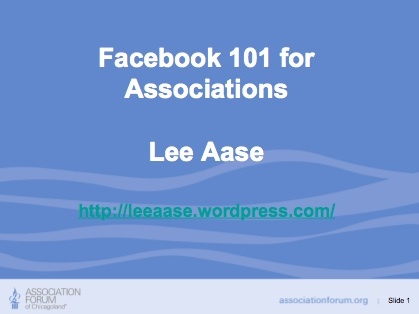 Here’s the “Lee’s Notes” version of the workshop I presented as Facebook 101 to the Association Forum of Chicagoland. If you want to download the PDF of my slide handout, click the link below. For the take-home assignments I offered those association executives, click here. If you haven’t already done it, your main bit of homework, as SMUG students, is to join Facebook and friend me. I would welcome any questions or comments you have about the slides. I can’t wait to learn more about Facebook…I use it every day but i KNOW there are so many more things you can do with it. I’ve never explored the statistics available through Facebook. I convinced my bf to open a FB fanpage for his small role playing company recently, so hopefully I’ll be able to help him tap into some of those tools. Next Next post: Why SMUG?